During most of mankind’s life upon the earth man has been adapted to a natural environment getting his water from unpolluted springs, streams and shallow wells. This water has been relatively pure containing only moderate amounts of naturally occurring substances. But conditions have changed. Since the industrial revolution, and especially since World War II, we have dumped synthetic chemicals by thousands into the environment. We are not adapted to these man-made chemicals nor can we adapt. We know that many of these chemicals are toxic. We do not know the long range effects they will have on our bodies or on the bodies of our children. But we do know that as long as we are drinking LE BLEU ULTRA PURE DESTILLED WATER we are consuming water that is good to the taste and good for health. Scientists have proven over the years that water is one of the most efficient solvents known to man. In fact, water dissolves, absorbs and carries with it something of everything it touches. It is property of being a universal solvent that has allowed our drinking water to perform its life-giving functions in the body as well as become loaded with virtually every contaminant dumped in the environment. Some people have the mistaken belief that essential minerals are derived from the water they drink. Yes, we do need minerals, but the source of minerals for the body is the food we eat – not the water we drink. Plants have the unique ability to convert inorganic minerals merely contaminate our drinking water. These minerals merely contaminate our drinking water and hinder other water from performing its natural functions. In addition to these unusable minerals water may carry hundreds of heavy metals, toxic chemicals and organic chemicals into our bodies, which may begin accumulating there. When our drinking water is already polluted its natural cleansing functions are impaired. As a result we may develop health problems as these pollutant build up on our blood vessels, joints and internal organs. Le Bleu Ultra-Pure distilled water enters our systems clean. It is free to absorb and wash away the poisons our systems generate and the poisons that have accumulated in our bodies. Some health specialists believe we experience hardening of the arteries, arthritis, kidney stones, gall stones, vision problems (glaucoma and cataracts), emphysema and other ailments in greater intensities and more frequently when we consume polluted or contaminated water. Of the several types of water, such as rain, snow-melt, raw, hard, filtered, soft, de-ionized, boiled and distilled – only distilled is PURE and virtually free from contaminants. As a result, distilled water has no taste, no color, no odor, no bacteria, and no harmful substances of any kind. It is good to drink and is good for the body! What a delight it is to drink a glass full of frozen juice made with distilled water! Without the chemicals and minerals in the water there is nothing to hide the natural fresh taste of the fruit. Many people have told me they cannot drink their favorite beverage made with tap water once the begin using Le Bleu distilled water. 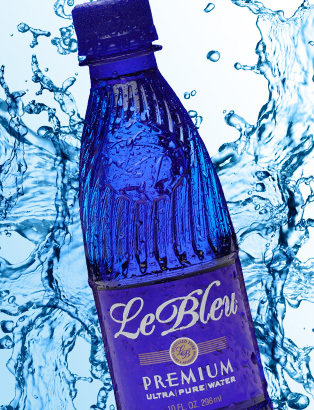 Le Bleu distilled water also makes food cooked in water tastier and the colors remain bright like nature intended since there is no chlorine or other toxic substances to turn them brownish-yellow. Chlorine, which has been added to our tap water to kill bacteria and parasitic organisms, may be one of the most dangerous chemicals we consume. Research studies indicate that chlorine combines with the organic substances found in tap water to produce chlorinated hydrocarbons that may be involved in such insidious diseases as hardening the arteries, heart attacks and cancer. Why do I prefer Le Bleu Ultra-Pure bottled water? I have found through extensive research and experience that water purification is tough business. It is extremely difficult to clean and service water purification equipment and keep it performing at peak efficiency. Only a company with sufficient knowledge base, resources and dedication can put together the right assemblage of water purification and equipment that can consistently produce Ultra-Pure water. I am convinced that Le Blue is that company. The patent pending multistage water purification process, which they use, makes the water purer and fresher than spring water. The stainless steel equipment using in the super clean plant and the laboratory water test results all attest to this fact. Consequently, I find it more convenient to have Le Bleu purify my water than to purify it myself. Besides, they produce water that is Ultra-Pure! Your body is about 70% water by weight. Water is used for breathing, digestion, elimination, glandular activities, heat dissipation and secretion, all of which are enhanced when water is pure. Distillation is the oldest purification process known to man and is the only purification process which literally separated the pollutants from the water and discharges them to drain. All other purification processes must use some type of trap or barrier when trying to remove pollutants from water, and as we all know, traps and barriers don’t always work. The World Health Organization stated that 80% of the world’s sickness and disease can be traced to unhealthy water. America is the most educated and advanced nation on earth yet the American people are some of the sickest people on earth. While China is one of the poorest countries, the Chinese are some of the healthiest people and have the longest life expectancy. I hope the information in this brochure provided you with a better understanding about water. Please consider helping yourself and start drinking Le Bleu Ultra-Pure steam distilled water. When purchasing any distilled water, make sure it is bottled either in a PETE plastic, polycarbonate plastic or glass bottle. Never purchase pure distilled water in a polyethylene or polyvinylchloride (PVC) container.